My best crop of wild mushrooms usually comes from the lawn of some friends who live about a 45-minute walk away, the perfect distance for a bit of exercise. I have their permission to pick any and all fungi from their property. Usually, it's horse mushrooms. My favorites. Tasty, easy to identify, and given the right weather conditions, apt to grow to a phenomenal size. I had just heard that they were selling their property, so this morning I headed over there to see if the latest rain had produced a crop. And indeed it had. Fearful that some hired person might come and mow down my dinner, I picked all there was. Normally, I would have allowed them to grow a bit bigger. 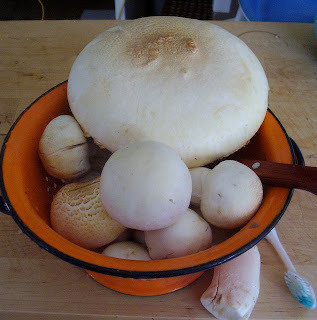 I'm greedy when it comes to horse mushrooms. Enough for a large, lovely frittata. 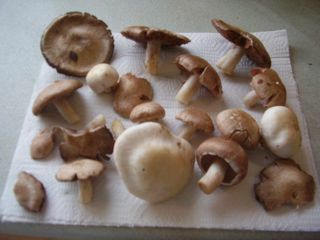 I gave the recipe for preparing and cooking wild mushrooms in this earlier post.